Welcome to our Screwpile Lighthouse Challenge page for 2018! 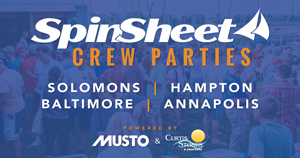 The three-day regatta will unfold July 21-23 in Solomons, MD. Current charts will be provided by Weather Routing, Inc. (WRI) during the event and posted to this page. Find PHOTOS from the 2017 event here. Gosh, we all looked so young. We held a contest over the weekend for the best Sailor Selfies. The only condition was that they had to be taken during Screwpile, and somewhat PG-13. We're still getting our land legs back underneath us, we can admit it. Over the course of Screwpile 2013 we had an absolute blast and we can't help looking back at all the awesome pictures so we can relive it over and over! SpinSheet's Duffy Perkins is on the water today capturing the racing. Race committee delayed on land this morning, and racing is on now!